Recently we started noticing double indented listings when searching Google. A two indented listings i s a none indented search result for a domain followed by two indented search results related to the same domain. 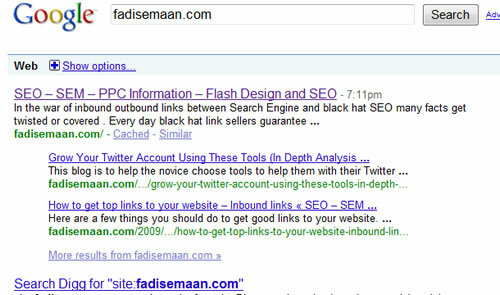 For example if you search “fadisemaan.com” you will notice that a 3 listings will show up in in the search result page. achieving market dominance easily over your competition. The most interesting aspect of this phenomenon is that Google does not count the two indented listing as three results on the page but as one i.e. on the result page there will be a total of 12 results listed not 10. We are not going to discuss the criteria s to get double indented listings because we are not sure if it is here to remain . Only time will tell and when it will become a fact we will discuss how to achieve it. How Is Double indented listing is different from Single indented listing ? Single indented listing is very well known and has been around for few years, Google and Yahoo do indent listings but not Bing. 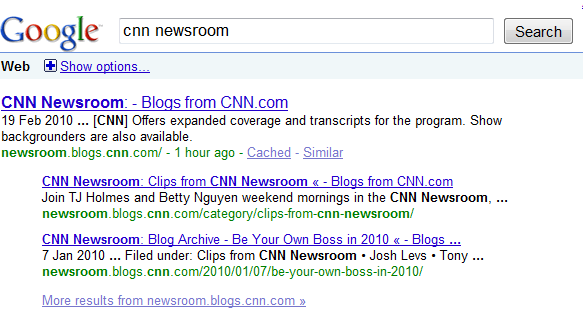 Single indented listing happens when you have two indexed pages of your website are related to a same keyword. Google treats single indented listing as a result so on a search results page you will have a total of 10 listings among which you have two, while in the case of double indented listings you will have a total of 12 results on the search result page among which 3 are yours. whatever is the case if you achieved single indented listing or a double indented listing it is all good news for your website, since you are taking more real estate on a SERP and you are getting more attention from the prospects who are using Google . If you want to know more about SEO visit us at our SEO toronto site and drop us an email .